Pregnancy brings a new meaning to the concept of beauty. It is a period of immense joy, coupled with excitement, daunt, happiness, eagerness and wonderment. The feeling of carrying a little soul within you is magnificent, those first fluttering little movements, a connection only you will ever know. Soul and spirit are stretched – along with body – making pregnancy a time of transition, growth, and profound beginnings. Amongst all of that, Maternity photography captures for a moment, you just how amazing you are! It lets you forget the puffy feet, the heartburn, the frequent bathroom trips, to celebrate for a moment, all that is woman. 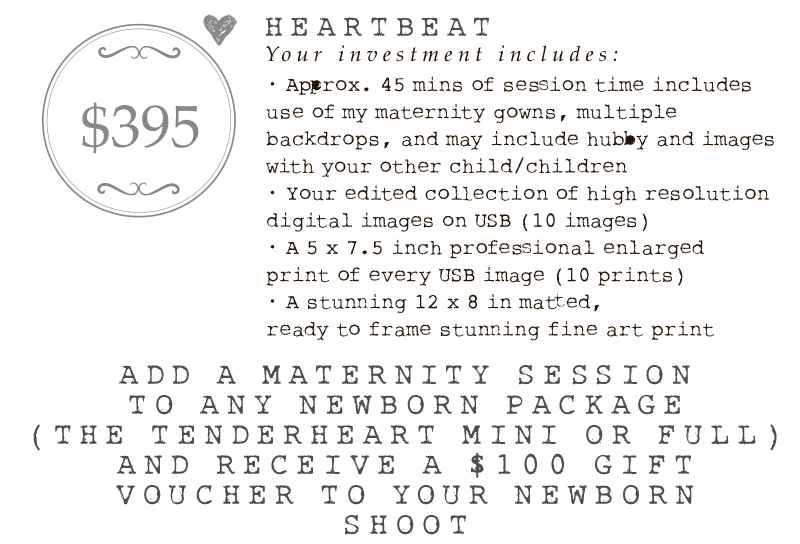 Let me capture your maternity photos. Image credit in order: Far left – Sprout Newborn Photography by my lovely friend Kate Lowe, Centre sunset maternity photo – My lovely husband under direct instruction (lots of nagging), Far right – Dewdrops photography by Amy McDaniel. The centre image is me 35+5 weeks pregnant with my first daughter Harper, and the end images 36+2 weeks pregnant with little Mollie as a model for 12 photographers (so I know daunting!!!) and the incredible US Newborn Photographer – Amy McDaniel.